Before Sunday, I had always bought my own granola. **Don’t even get me started on how long it took me to pick from the 10+ dispensers of granola the Whole Foods bulk aisle has. ** I thought it was about time I ventured into the world of homemade granola making, because, well why not? 1. Homemade granola is easy. 2. 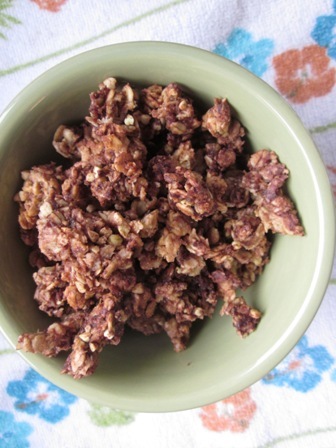 Homemade granola is faster than going to the store. 3. Homemade granola is tasty. 4. 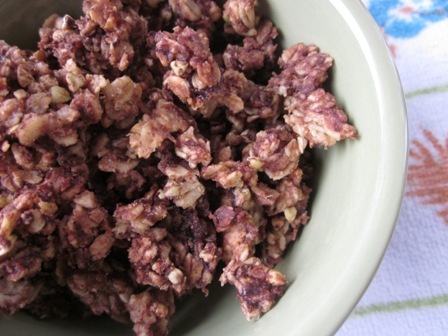 Homemade granola is yet another way to incorporate more oats, almonds, cashews, cranberries, chocolate and peanut butter into my life. 5. #4 is the only point that really matters. **I used sweetened applesauce so I didn’t add any sugar, but if you’re using unsweetened you might want to add 1 tablespoon of sugar or sucanat. **You can sub another liquid sweetener for the maple syrup if you’d like. I would have used brown rice syrup if I’d had any. 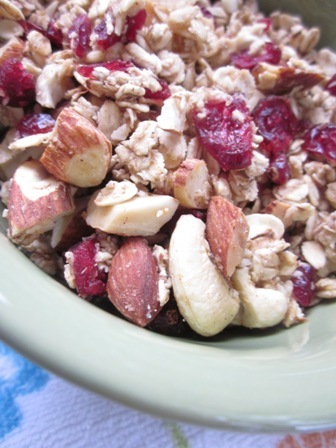 Mix dry ingredients together in a bowl (oats, dried cranberries, cashews, almonds, salt and cinnamon). In a second bowl, mix together wet ingredients (applesauce, coconut oil, maple syrup and vanilla). Add wet ingredients to dry, mix and spread on a pan covered in parchment paper. Bake for 20-25 minutes, stirring every 5 minutes or so. Let cool for at least 30 minutes (it will harden up as it cools). Store in an airtight container. In a second bowl, mix together wet ingredients (applesauce, vanilla, maple syrup, coconut oil and peanut butter). Bake 20-25 minutes, stirring every 5 minutes of so. 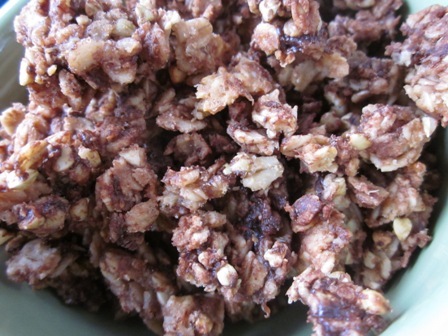 **The chocolate chips will get melty when you add the oil and peanut butter, so if you want your chocolate to stay more in tact I would suggest adding it after the granola has cooled. I was really excited about these granolas and surprised at how easily they came together. And even more surprised at how easily I could shovel handfuls into my mouth. Just kidding, that part wasn’t surprising. How about a picture just for fun? 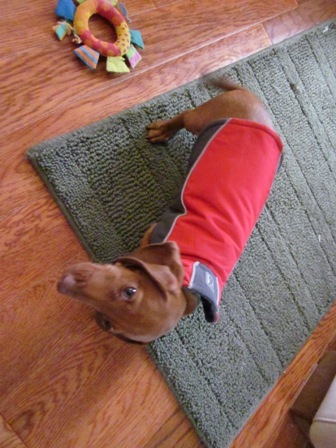 That would be Huni (my mom’s puppy) stuck to the rug because her jacket has velcro on it. And of course, my mom and I just laughed and took pictures instead of helping. Don’t worry she freed herself. 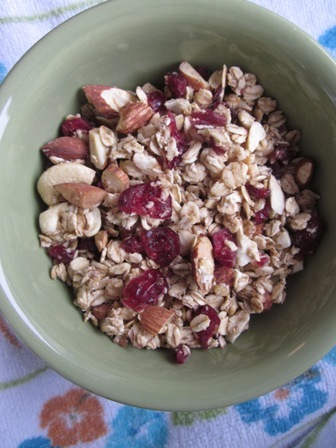 Making granola is so easy and quick, but I don’t do it as much as I should! I have yet to make my own granola. but I should. I’d love to find a way to make it lower-cal so I can eat more of it! I’m with you on that one! I always wonder how such a low cal food like oatmeal can make such a high cal snack. That chocolate granola looks AMAZING!!! I love homemade granola! It tastes way better then store-bought and it really is so simple to make. I’ve only ever made it twice but that’s just because me + granola = zero granola super fast. Ha ha I have a feeling I will be the same way!